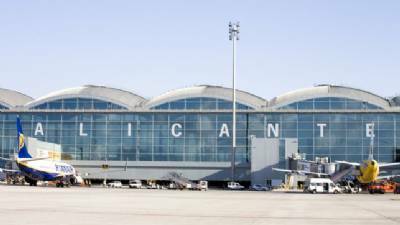 AN ENTIRE team of football fans were thrown off an airline and arrested at Alicante airport due to rowdy behaviour, the Guardia Civil and air transport governing body AENA confirmed last night (Friday). Although the incident was not revealed until a few hours ago, police said it happened on Saturday, April 6 at 22.50 when the plane landed from Bristol. The group of 25 British passengers, all very drunk, were acting 'aggressively' and causing a nuisance to their fellow travellers. Police boarded the aircraft when they were summoned by the pilot upon landing, who reported a 'public order issue'. Cabin crew had attempted to resolve the situation, but the 25 football fans jeered at them and refused to pay heed. When they were arrested en masse and ordered off the plane, the rest of the passengers whooped, cheered and clapped. Some airlines have banned alcohol on certain 'problematic' routes because of similar incidents which have even involved emergency landings to remove troublesome groups of passengers. Certain budget carriers have stopped serving alcohol on the Glasgow-Ibiza route, where at least two sudden landings have been made halfway due to disorderly behaviour.